In 2017 and early 2018 the performance of the export-oriented Danish machines/engineering sector was mixed. Growth was driven by exports of energy optimisation products used in areas such as heating, cooling and water treatment. The same accounts for producers of machines used for automatistion in the manufacturing process. However, there was stagnation in some major segments, negatively affecting profit margins of businesses. The wind turbine industry and its subsectors are an important segment of the Danish engineering sector. Globally the long-term growth outlook for wind energy is still positive, but dynamics have changed as sales prices of power generated by wind energy are decreasing. This has put pressure on the profits of turbine manufacturers and their suppliers along the value chain, and further consolidation in the segment seems to be likely. In the coming years rising liquidity issues or even an increasing number of defaults of suppliers are expected. Machinery businesses dependent on the offshore oil and gas industry performed rather weakly in 2016 and 2017, as developers have not substantially increased demand. A comprehensive rebound in this segment would require further increase in oil and gas prices. 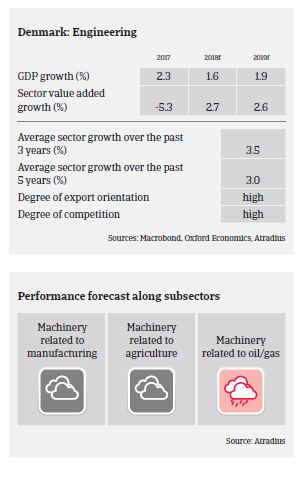 Producers of agricultural machines have been affected by lower investments made by the European farming sector, while the dry summer in 2018 is expected to have an additional negative effect on farmers´ financial strength. Despite this, several export-oriented agricultural machinery producers have been successful in diversifying by increasing their share of sales in overseas markets. Payments in the Danish machinery sector take 90 days on average and up to 125 days in the wind-turbine segment. Payment experience has been good over the past two years. However, the number of payment delays, defaults and insolvencies is expected to increase in the coming months and in 2019, especially in the wind-turbine and oil- and gas-related segments. Insolvencies in the machinery sector mainly affect smaller players who are overly dependent on a few, large customers, coupled with high production costs and and where restrictive access to bank financing has put pressure on liquidity. Therefore, we continue to monitor smaller players more closely. Our underwriting stance on the sector is generally neutral, but more restrictive for businesses in the troubled subsectors.